Chrichton's World: Review Keanu (2016): One drawn out Key & Peele sketch that goes on far too long. 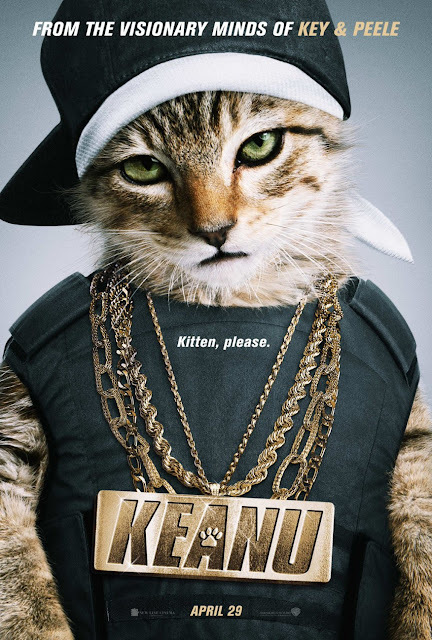 Not even Keanu one of the cutest kittens can save this movie! Review Keanu (2016): One drawn out Key & Peele sketch that goes on far too long. Not even Keanu one of the cutest kittens can save this movie! Keanu (or whatever his real name is) steals the show every scene he is in. Sadly he is not in this movie as much as you would like. Key & Peele the comic duo basically do one of their sketches in their show. Sometimes the comic duo have real good and funny ideas that will crack you up. Usually those sketches are short and to the point. Unfortunately for us it is one of those lesser ideas that goes on far too long. Sure don't get me wrong having normal citizens pretend to be gangsters could provide a number of laughs. Problem is this is plot device that has been done too often already. And in order to do something new and fresh you really have to step it up a notch or two. But both Key and Peele play it far too safe and surprisingly never go over the top. If there ever was a time to embrace the absurdity and bizarre it was now. Worked for Grimsby like a charm. The minute we get introduced to these ruthless killers who resemble Key and Peele a lot (probably because it is them) I knew how everything was going to play out. For me this was not that big of a deal had they even tried to do something fun with them. Why not show them how these silent assassins would torture people? Or why not have Key and Peele go all Taken on everyone since that has been a running joke in the show for a while. It would have been hilarious to have Peel murder and mutilate people just to get his kitten back. That is what I had hoped to see. Instead we get one predictable event after another and all this time I was hoping for the film to be over already. Some jokes made me laugh briefly. Like the George Michael bit which simply was not enough. Especially if you compare to what Key and Peel do in their show everything felt diluted and tame. Keanu the kitten did his best to make the most of it and if it weren't for him I would not have stuck watching. But even he can't help to make this worth your while. Stick to watching the trailer and then be done with it.